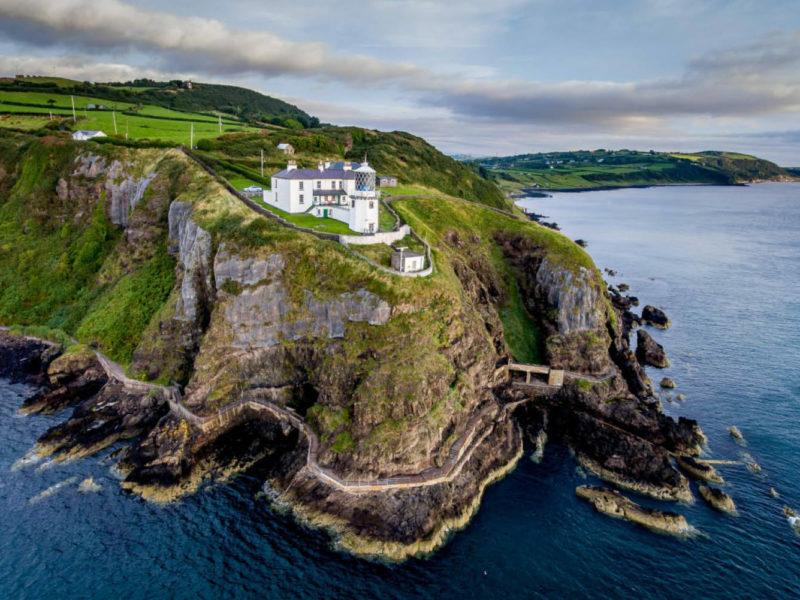 Find your inner lighthouse keeper with a stay at the Blackhead Cutter lighthouse. Want to see a different side of the Emerald Isle? Go in search of seven very special places to rest your head. Ireland has always been beautiful, but today it’s a vibrant, exciting and creatively diverse place to visit. 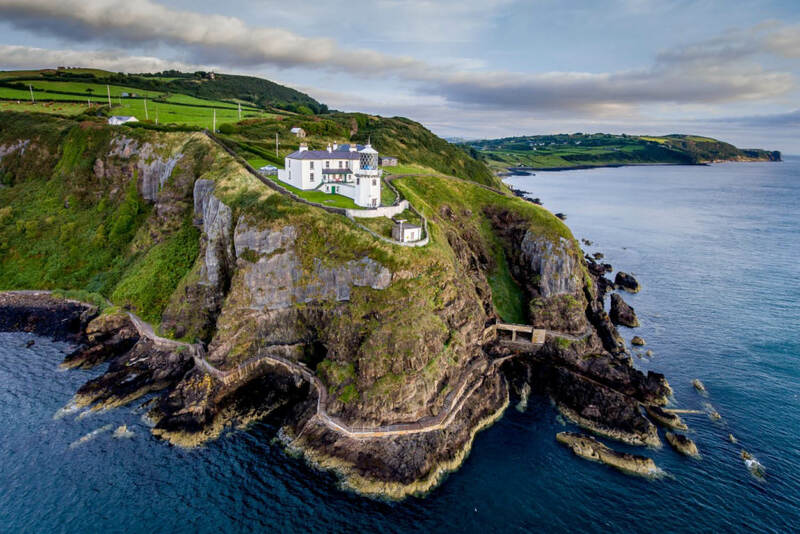 Staying in Ireland means you could find yourself sleeping in a 100-year-old lighthouse, a yurt or a castle, even in a transparent dome where the stars will lull you to sleep. Welcome to a new, unique side of Ireland. Finn Lough Resort is one of those places you hear about, but can’t imagine that such a spot actually exists; it’s that spectacular. Sure, you can stay in one of their lakeside lodges overlooking picturesque Lower Lough Erne, or in a cottage or catered suite, but the real magic happens in their bubble-like Forest Domes. With 180-degree views, you’re immersed in nature in the most luxurious way possible: with a four-poster bed, en-suite bathroom, fluffy robes and comfy slippers. There are even telescopes for night-time stargazing. Titanic Belfast is the world’s biggest Titanic visitor attraction. This majestic building stands on the very site where Titanic was built, and boasts nine galleries covering everything from Belfast’s shipbuilding heritage to the discovery of the wreck. Belfast was once a great ship-building city, and from 1909 to 1911 Harland and Wolff constructed the most famous ship of all here, the RMS Titanic. To honour its legacy, the shipyard has been regenerated into Titanic Quarter. Here, you’ll find restaurants, the Titanic Belfast visitor attraction and the recently opened luxurious Titanic Hotel. Built into the old Harland and Wolff headquarters (where the drawings for the Titanic were made), 119 rooms celebrate the ill-fated ship with Art Deco styling harking back to a bygone era and nautical elements throughout. Clomantagh Castle in County Kilkenny, sleeps up to 10 people over five bedrooms (one with a spectacular four-poster), so bring a crew. Want to pretend you’re on the set of a Medieval film for a few days? Then head to Clomantagh Castle in County Kilkeny. It sleeps up to 10 people over five bedrooms (one with a spectacular four-poster), so bring a crew. The buildings in the complex date back to the 12th century, and there’s even a tower from the 1430s that is sure to fuel wild imaginations. Hang out in a yurt, surrounded by mountains and the Atlantic Ocean, boasting a deck area, fire pit and barbecue. We know, we know – the rain in Ireland is famous, so why would you want to sleep in a tent? Well in fact, the sun shines for around 300 days of the year – and if you go in summer it has some simply stunning locations to spend time outdoors (16 hours of daylight a day, anyone?). County Donegal is renowned for being one of the country’s most picturesque regions and it is there that you will find Portsalon Luxury Camping and their five Mongolian-style yurts. Kitted out with king-size beds, wood-burning stoves, carpets and lockable front doors, they house four to six people each, and cost as little as €65 a night. Surrounded by mountains and the Atlantic Ocean, they also boast a deck area, fire pit and barbecue. This is camping for people who don’t do camping. Who didn’t watch Round the Twist and long to live in a lighthouse? Well now you can make that dream come true. Stay at the Blackhead Cutter overlooking Belfast Lough. Your abode is within one of the original Lightkeepers’ Houses, where lightkeepers lived and worked until 1975, witnessing Belfast’s many ships leaving port – including the Titanic. Who needs a hotel when you can stay on a barge? Riversdale Holidays offer stays on their three beautiful barges, for trips up and down the picturesque Shannon-Erne Waterway. Be your own captain as you glide along the water on a traditional narrowboat, complete with all the mod-cons of central heating and wood-burning stove. You couldn’t be more secure in the Martello Tower Sutton. Built in 1804 to defend against the growing threat of Napoleon Bonaparte’s forces, Martello Tower Sutton was the first of its kind to be built in Dublin to protect the city. Built with 2- to 4-metre-thick walls, the doorway is 3 metres above ground and was once only accessible by ladder (thankfully there is now a staircase). Today, it has been transformed into a beautiful three-floored holiday home replete with stone-walled living room, two double bedrooms and a balcony overlooking the water. The top-floor kitchen means you can source some of the incredible local seafood and eat it up here with 360-degree views of the bay.